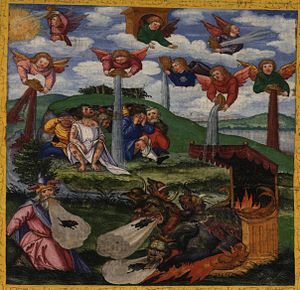 Now in chapter 15 and 16 of Revelation, we see 7 more angels doing the Lord’s work. They have the 7 vials full of 7 plagues that will be poured out on earth. Rev. 15:1 “And I saw another sign in heaven, great and marvellous, seven angels having the seven last plagues; for in them is filled up the wrath of God.” These plagues are the wrath of God. A third song is heard in Heaven – Rev. 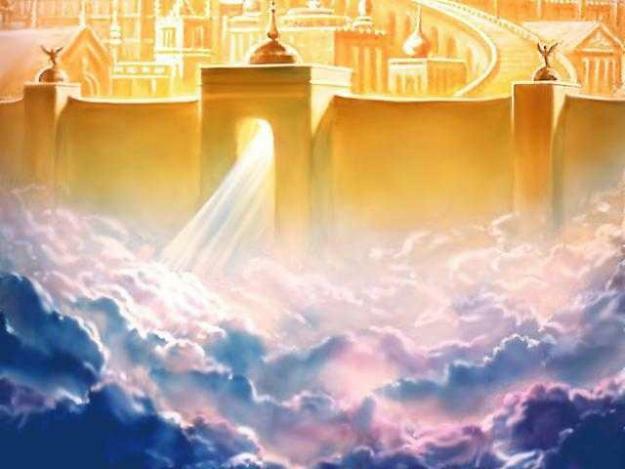 15:3-4 “And they sing the song of Moses the servant of God, and the song of the Lamb, saying, Great and marvellous are thy works, Lord God Almighty; just and true are thy ways, thou King of saints. Who shall not fear thee, O Lord, and glorify thy name? for thou only art holy: for all nations shall come and worship before thee; for thy judgments are made manifest.” This is a song that originated with Moses and the Lamb, Jesus Christ. Maybe some songs written by other humans will also be sung in Heaven. You never know. Another angel leaves Heaven having great power. He is so glorious that he lights the whole earth. He pronounces judgment on Babylon (the one-world commercial, religious, and political system of the anti-Christ). All devils have been cast out of Heaven and now inhabit the earth. It becomes more foul, unclean, and hateful than ever before. Rev. 18:1-3 “And after these things I saw another angel come down from heaven, having great power; and the earth was lightened with his glory. And he cried mightily with a strong voice, saying, Babylon the great is fallen, is fallen, and is become the habitation of devils, and the hold of every foul spirit, and a cage of every unclean and hateful bird. For all nations have drunk of the wine of the wrath of her fornication, and the kings of the earth have committed fornication with her, and the merchants of the earth are waxed rich through the abundance of her delicacies.” The evil pleasures of this world are but for a season. There is a celebration in the Third Heaven. A great voice of many people proclaims “Alleluia!” Rev. 19:1-6 “And after these things I heard a great voice of much people in heaven, saying, Alleluia; Salvation, and glory, and honour, and power, unto the Lord our God: For true and righteous are his judgments: for he hath judged the great whore, which did corrupt the earth with her fornication, and hath avenged the blood of his servants at her hand. And again they said, Alleluia And her smoke rose up for ever and ever. And the four and twenty elders and the four beasts fell down and worshipped God that sat on the throne, saying, Amen; Alleluia. And a voice came out of the throne, saying, Praise our God, all ye his servants, and ye that fear him, both small and great. And I heard as it were the voice of a great multitude, and as the voice of many waters, and as the voice of mighty thunderings, saying, Alleluia: for the Lord God omnipotent reigneth.” Ooooh, I get chills up my spine just imagining this! There are many people in Heaven! God has delivered His people, judged the great whore (One-World Babylon), and avenged the blood of the martyrs. God will have His way and He will have the last word! The all powerful, one and only, true God Jehovah will reign!